I know, I know- rough topic. This seems to be one hardest parts of planning our couples have to do on their own. We see a lot of complaints on social media about the topic too so it must be a pretty universal one. The question of who to invite and who to leave off the list is the cause of many an arguement between couples and their families. At the end of the day you have to be ruthless, selfish even and do what's best for you. Here are a few important questions to ask yourself first. Is this an important person in my life? Of course the first time you draft a list, it's easy because you just note down all your close friends and family and there's no question mark on whether or not they'd be invited. It gets a little harder when you start adding collegues and outer members of your friend circles. Ask your self if they are important to you, would you mind if the shoe was on the other foot and they didn't invite you to their wedding? Have I seen or spoken at length to this person in the last year? This is where it gets tricky, maybe this person invited you to their wedding a few years back but you have since drifted apart. If you havn't seen someone or at least spoken to them in the last year then it's pretty clear they are a no. Is this person someone who is going to be in my life going forward? There's the awkward selection of people that maybe you have only just met or maybe you arn't that close with but run in the same circles. This is when you ask yourself if this person going to continue to be a part of your life from going forward? Then maybe yes they should be on the list. Are you inviting everyone else in the family/group? I see this one a lot where couples invite all but one cousin or all but one friend in a circle. If this is beacuse you just get on with that person and don't want them there then don't do it,simple. Maybe you just arn't as close to them in which case try and add them if you can. It could future encounters with them awkward for you both otherwise. Is this a good person to be around? There are situations where you may feel pressure to invite someone but they just rain on your parade or don't make you feel very good when your together. This is your day and feeling comfortable is so important. Do I want them enough to invite them plus one? 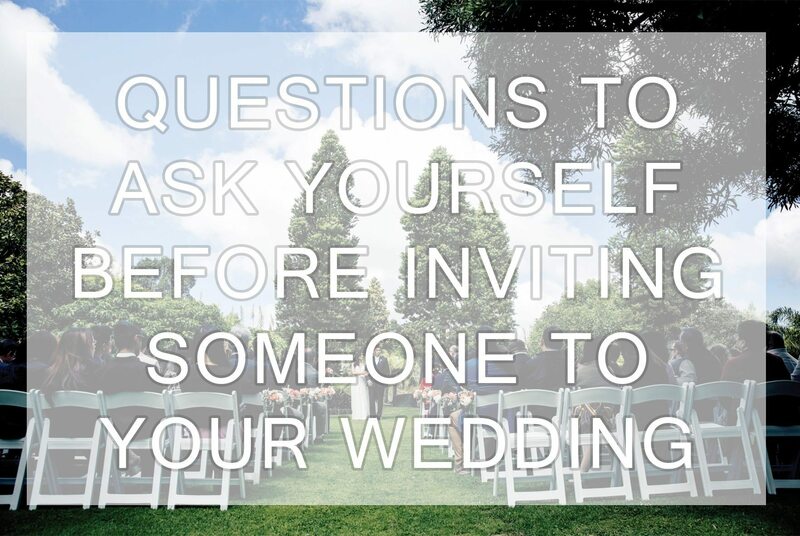 It's a bit of a no-no to invite a person in a relationship to a wedding on their own. Ask yourself if you like this person enough to invite their partner also.